Downloading YGOPRO 2 is easy, start by clicking on one of the mirrors for your operating system. After you download YGOPRO 2 extract the game by right clicking on the downloaded file and selecting ‘Extract All’, once the game has finished extracting, open the launcher, if you already have a Kaiba Corporation account you can log in immediately and start dueling, if you don’t have a Kaiba Corporation account then register one and then log in. YGOPRO 2 is the best free Yu-Gi-Oh! Online game; in addition to being fully automatic, YGOPRO 2 is constantly updated with new cards from both TCG and OCG card sets. You can play single, match and tag duels using either unrated or rated dueling modes. All cards are available as soon as you install the game. New cards are automatically added using our auto updater as soon as we release them. We offer multiple single player opponents for you to duel. If you are looking to test new decks you can duel against DuelTek 760, our latest beyond state of the art dueling robot, if you are looking for something easier you can try playing against Dueling Robot and if you are looking to duel against some popular anime opponents then you can duel against Yugi Muto, Seto Kaiba, Joey Wheeler and Dartz. Our advanced social features allow you to create teams, participate in team wars, share decks with other members and much more. We host weekly tournaments and events, visit our forums for more information. You can full customize the game; you are able to edit both the game textures, sounds and card images. 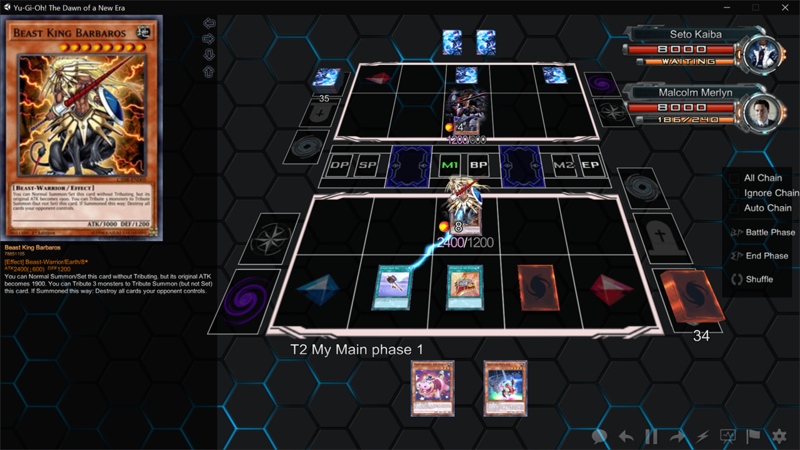 YGOPRO 2 is fully compatible with Yu-Gi-Oh! The Dawn of a New Era, or TDOANE for short. With thousands of different users playing the game every day you will never run out of new opponents to duel against. We are currently working on real duel disks, by using our games you support our duel disk project and all other related projects.